I made these two rosaries with fire polished faceted Czech glass beads, seed beads and other glass bead accents. 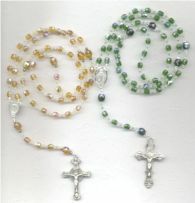 Both rosaries are strung on flexible jewelry wire and finished with pewter rosary centers and crucifixes. Another fabulous Christmas gift for a friend, a favorite teacher, or a coworker. And don't forget Mom! Featuring Swarovski crystal beads in different colors and shapes, and Christmas theme charms.